Resin sets from Czech Republic. Old product line sold to BP Resin, but JK Resin have now started a new product line. 72001 Pz.Kpfw. IV Zimmerit Resin zimmerit parts for Revell kit. 72002 German 75mm Ammo (PzGr.39) 18 resin pieces: 8 complete and 10 empty shells. For Panzer IV, Stug. III and Stug. IV. 72003 StuH. III Ausf. G Late Resin conversion parts for Revell kit. 72004 Stug. III Ausf. G Late Resin conversion parts for Revell kit. 72005 Elefant Exterior Set Resin detail parts for Dragon kit. 72007 Pz.Kpfw. VI King Tiger Ammo Set 14 resin pieces: 7 complete and 7 empty shells. 72012 German Width Indicator Rods Resin and brass rod. 72013 German Lights Includes Bosch and Notek lights, and tail lights, four of each. 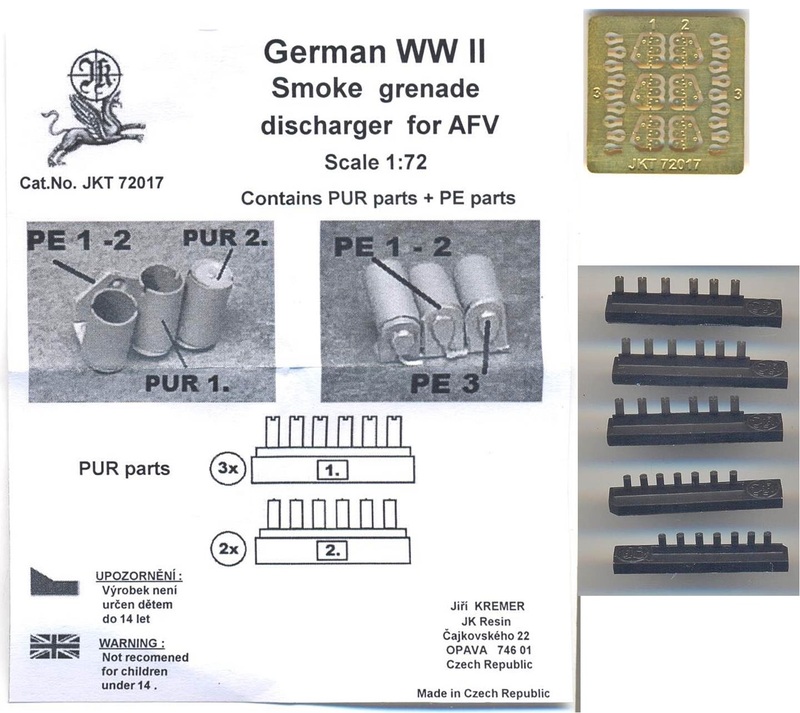 WW2 German smoke grenades for AFV Resin and PE to create 6 German smoke grenade launchers (with three launchers each) and 12 cartridges. All parts are extremely (!) finely rendered with incredibly thin walls for the hollow launchers, for instance. JKT72028 Antiskid Plate "Diamond Pattern"
JKT72042 Luftwaffe Ammo Boxes for MG-FF, MG151, MG131, MK103, El.Az.